Your knitting is lovely. I cannot wait for the stranded mitten pattern! Oh my! We both have the same problem. I have a finished entrelac hat (my own design) and a perfectly tailored Salt Peanuts that I’ve finished but have not blogged about. I did finally get the pictures up yesterday, but I really want to get a picture of Salt Peanuts being worn, not just displayed on the bed. But I have so many other interesting projects, I just can’t seem to get it done. Cheers! yes you have a lot of unfinished business there. will you sell your mitten pattern without the yarn? just wondering. Claps hands..waves hands in the air !! that vest is going to be ace!!!! maybe i should work on the vest sleeping in the bottom of my knitting basket??? I forgot to mention how much I like your dueling (cabled) banjos. The vest is coming along so beautifully, I especially love the banjo cables. And of course I’m always a sucker for anything EZ. On the other hand, Alice Starmore is hard to beat too. I knit a Na Craga for my brother in law (you can see pics of it here: http://coco-knits.blogspot.com/2007/05/baby-sweater-cough-what-baby-sweater.html and it totally set me on an obsession for AS cable designs. I just hope you’ll have enough mitten kits! So many of us want them! Everything you do is so wonderful. 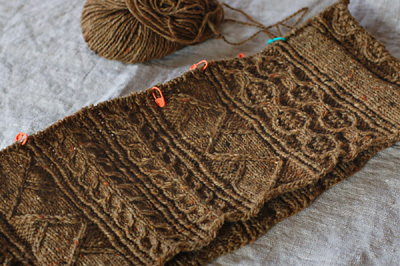 I have the saddle shoulder aran pattern but I’ve been too intimidated to start it. Still am! 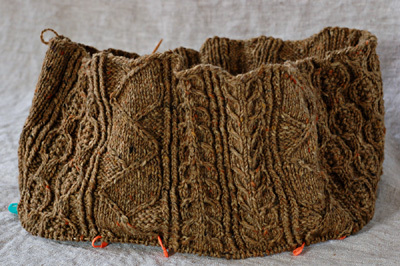 I think I’ll have to gain some swatching skills…..
Love the yarn and love the cables. I can’t wait to see your finished vest. I agree with you about the crocheted steeks. I used them for my first ever steek project and really like the finish they give. FO, UFO, we are the same ! Oh lordy that is gorgeous. Really shows off the cables. The vest is going to be incredible. Of course. :) That’s why I keep coming back here…for The Incredible. Full Disclosure: On of my heel pieces has come off my slipper. I think it’s because the end of the cotton embroidery thread wasn’t secured, but I haven’t had a chance to investigate because I can’t take my slippers off for that long. It’s probably an easy fix, but I’d rather be wearing my slippers than have cold feet so the repair will just have to wait. The vest looks fantastic! I love those tweedy cables oh so much. So excited to hear about the impending mitten kits!! The stitch pattern on the vest is awesome. I have wanted to try steeking, but have been too nervous as of yet. Someday I will try it. I have given you a little award :) See my blog. And I’m super excited about the mitten kits!! it is lovely. i am about to connect sleeves and body on my saddle shouldered aran and i agree that the sheepfold is too lovely to be left out. i have been checking out the banjo cable as well and i love it. great idea. and good luck on na craga. if only one could get near the book it is in. it is just too bad it is not reprinted since it is in such great demand and obviously contains a lot of knitting history too which is my passion. knit on. ps. kent’s is so great and i cannot wait till he finishes it. That’s going to be one good looking vest, though! I love this. How do you plan on finishing the bottom? I ahven’t made any vests yet, aside from Ribwarmers, so this is fascinating. Hope you’ll share all your tricks. This is an odd thing to say, but itâ€™s part of a memeâ€™s instructisonâ€¦ Basically, you made my day – see the second half of this blog post for details. Yay for Fiddleheads coming out on my birthday! That vest looks like it will be beautiful! I love the tweedy yarn you chose for it.